A forex dealer’s job is to quote a price at which he will buy from sellers and will sell to buyers. They keep the market moving so that buyers and sellers can obtain a price and execute their trade at any time they want – even if there isn’t anyone on the other side of the deal. This is what’s known as making a market. This liquidity provider role is the main responsibility of the market maker. Imagine how difficult it would be to trade if you had to wait for a buyer when you wanted to sell your position. Or if you had to find a seller when you wanted to buy. The end point for most foreign exchange transactions of any size is the interbank market. The interbank is simply a network of dealers in large investment banks who buy and sell foreign currency. They do this for the bank’s own transactional needs as well as providing the wholesale market to institutional clients, hedge funds, and smaller brokerage firms. The role of the interbank dealer is for the most parts transparent. To retail traders, the primary dealer is often separated by several layers of brokers and middlemen. What these intermediaries will often do is aggregate blocks of trades but ultimately offset them through an interbank dealer. Gaining an insight into the role of the market maker can help in understanding the movements within the FX market. That’s what I’ll cover in this article. How do Dealers Create a Price? If you’ve ever traded through an ECN, you are effectively both a price taker and a price maker. Dealers make money by buying lower and selling higher than the price-takers do. However, unlike the price taker, they don’t do this by guessing which way the market will move. The dealer makes a profit by adding a spread, or markup to their quote. The bid is the price a dealer is willing to buy from you. The offer is where he is willing to sell to you. In normal markets, the bid is always lower than the offer, and the spread is the difference between them. The dealer’s decision on where to set the bid/offer at any instant is actually quite a complex one. He has to weigh up several competing factors. The most basic of these is the demand verses supply. When the dealer has more buyers than sellers, the price will increase. When there are more sellers than buyers, the price will drop. As well, the dealer has to consider quotes from other dealers so that his price remains in line with the broader market. If his quote is off, he will likely be arbitraged by other traders or dealers. A competitive quote has a tight spread. If the dealer’s spread is too wide, he will lose orders to other price makers. On the other hand, a dealer can quickly build up losses if the spread is too narrow – especially in a rapidly moving market. Interbank spreads are extremely competitive on major pairs such as EUR/USD, GBP/USD and USD/JPY and it is not unknown for banks to run market making desks as “loss leaders” to undercut rivals. A dealer will sometimes “make a call” on the quote or spread, in anticipation of future market moves. In practice, there is a “gray area” between the prop trader and dealer – even though the prop trader should not be privy to the flow of client orders. Volatility means more uncertainty and therefore higher risk. The dealer compensates for this by making trading more expensive for price takers with a higher spread. The dealer’s main responsibility is to maintain liquidity for the bank’s clients. That means always quoting a price. Dealers prefer to remain “neutral”, but they can build-up large losing positions in fast markets. When the market is rising, the dealer is selling, and when it is falling, he is buying. When there is a disparity between buyers and sellers, the dealer has to increase the spread to offset the risk. The dealer is axed, when he has a preference to trade a certain side. This means he will quote more favorably for a trade that reduces his risk. So on accumulating a large losing position – as in a rapidly rising or falling market, the dealer is likely to quote the market the other way to reduce their net exposure. For example, they can make the bid more attractive following a rising market, or the offer more attractive after a falling market. These events can create technical pivot points where dealers are trying to reduce their net exposure after a steep run. The dealer has to anticipate upcoming events such as news and economic releases. He also has to consider important technical indicators that may be giving traders signals to buy or sell. This allows him to anticipate changes in volatility. Most dealing desks of any size have automated quoting systems. These programs will weigh up the above elements and generate a continuous quote. Routine (small) order flow will go via the auto quoting systems, and this frees the dealer to handle bigger transactions on the phone. Why Dealers Always Make Money? If you ask Goldman Sachs or Merrill Lynch how they would rather to make profits, they’ll go with client fees every time. Dealers prefer to make money whichever way the market moves, they don’t want to rely on the market moving one way or another. You’ll no doubt have read forex forums which are rife with conspiracy theories about dealers moving markets against them – hunting stop losses and so on. While there are certainly cases of unfair execution practices, by controlling spreads, a good dealer can make a profit – in any market. Take the following example. 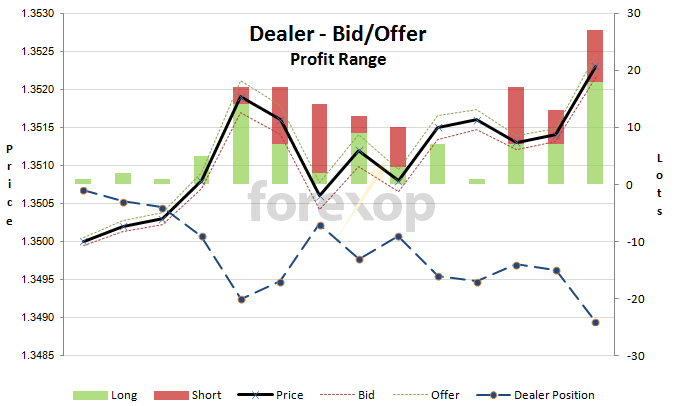 The table below shows a snapshot of a dealer’s order book, quote and positioning. The diagram in Figure 1 illustrates the order flow in the above table. The price mirrors the dealer’s order book, while the spread reflects volatility. When the price is rising, the dealer is short; when it is falling, the dealer is long. At the end of this order sequence, the dealer has a net position of -24 lots. Notice that even though the market is moving “against” him, he is still in profit. This is due to the spread earned on every trade. At this point, the dealer may choose to make his bid more attractive and offer less attractive to encourage more sellers into the market. Other dealers, likely in a similar position will do the same. As sellers come in, this will have the effect of pushing the price lower. As the price falls, the dealer’s net short position reduces and the additional volume means he makes more from the spreads. The cycle continues. The dealer earns profit mainly from volatility and spread management, not on the market direction. A higher volatility means a higher spread. The dealer needs continual order flow – or market depth to make money. 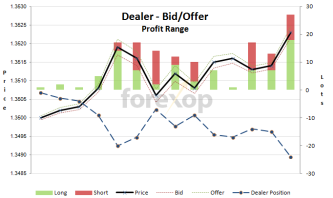 If order flow disappears, and the market moves against the dealer’s position he can accumulate a loss very quickly. Therefore, the second rule is that lower liquidity means the dealer must compensate with a higher spread. When the market trends quickly in one direction, the dealer can accumulate a net position against that move. When the dealer has net exposure, he will be looking to unwind risk by bettering the quote the other way. This means attracting sellers to a rising market or buyers to a falling market. He does this by tilting the spread. Dealer positioning can be a catalyst for pullbacks after sharp directional trends. The stronger the trend, the more extreme the dealer’s position is likely to be. Dealers cannot position against the market indefinitely. Without retracements, it is much harder for them to make a profit from the spread alone. It is possible to estimate dealer positioning from recent price history. Use overbought and oversold indicators on the charts to anticipate future price pressures and turning points. Taking the “contrarian stance” and going against the crowd can often work in these situations. Avoid entering or exiting at pivot points where volatility and spreads may be widening. I checked almost all your website and I want to gongratulate you for the interesting stuff you are uploading here. This is among the most original aproaches I have seen. Can you recommend a superfast LP that is providing API/FIX? I need it for getting the live tick data. Thank you!